WikiLeaks editor Julian Assange is answering questions at a press conference in response to allegations by US intelligence agencies that it worked with Russia to leak information to influence the US presidential elections. Assange believes whistleblowers will continue to be persecuted under Trump’s administration. “No system of authority likes those who undermine their authority,” he says. Assange dismisses as “false” the claim WikiLeaks had access to Republican National Committee (RNC) data which it refused to publish. 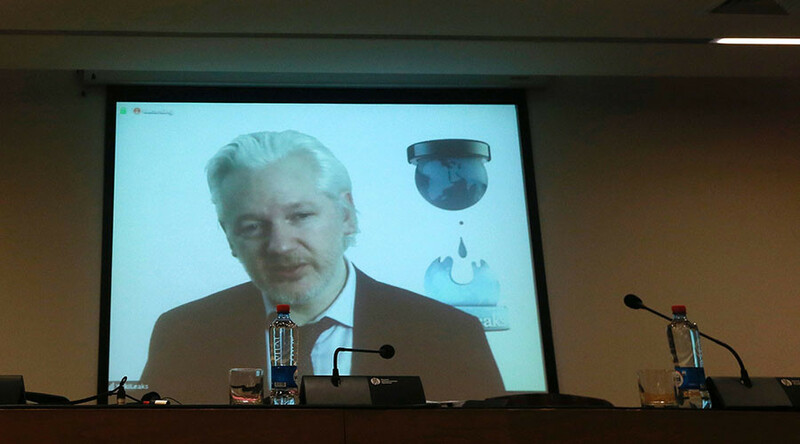 “If WIkiLeaks had an effect it's because people read the words of Hillary Clinton and her team and didn’t like what they saw,” Assange says, referencing the leaking of emails from John Podesta, Hillary Clinton’s campaign chair. The ODNI report “mutually endorses” that WikiLeaks has verified its information, Assange says, maintaining the organization was thrilled by the CIA’s interest in them. “There is no evidence of any kind supplied,” Assange. WikiLeaks have offered a reward for the exposure of anyone in the Obama administration involved in destroying information. “Take the data now, keep it under your bed or with your mother. You can give it to WikiLeaks,” says Assange. Asked if WikiLeaks is sure the leak wasn’t provided by the Russians, Assange said he could not provide additional information as this would contribute to identifying the source. “If our sources were a state we would have a lot less concern in attempting to protect them,” says Assange. “We haven’t said whether we know or don’t know or sources.” Assange says, reiterating that the source is not a state party. Assange criticizes the time frame of the report by the CIA which claims the DNC was hacked by Russians in 2015, when "Trump is clearly not on the horizon."